Eclectic Paperie: Stained Glass Window. Happy Boxing Day everyone! It's Toni here and it's actually Christmas Eve as I am writing this post and I do hope I will be forgiven for posting a slightly unfinished project but I have just about run out of time and with eight people for dinner tomorrow, I don't think I'll have time to fit in any crafting! 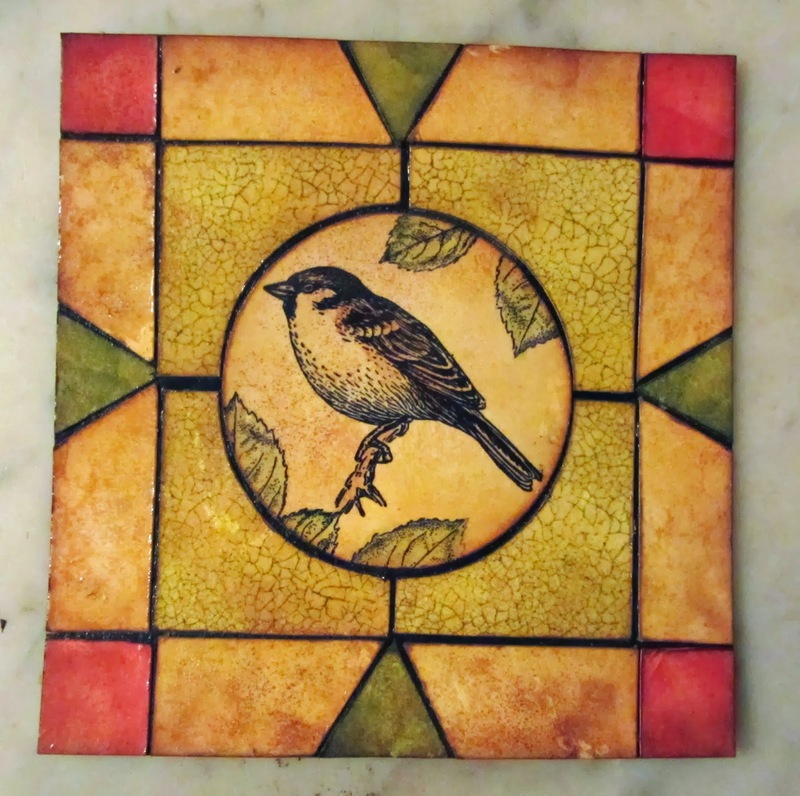 This project is inspired by a stained glass window we have in our house. I haven't decided yet whether it will become a hanging or a book cover. 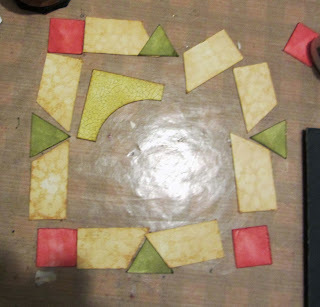 I started by dividing a piece of manila card into sections, using a compass and a ruler. I then cut it into sections and coloured the pieces with a variety of Distress Inks. I used some background stamps to add a little texture to the surface echoing the ripples on the original window. The bird stamp is from a set by Indigo Blue; it's similar to the one in my window. I stamped it in black Archival ink, and coloured it with Distress markers. I assembled all the pieces and adhered them to a piece of black card with Studio Matte Multi Medium, leaving a little space between each of the pieces. I then covered the whole of the surface with clear Versa mark, and heat embossed it with clear embossing powder. This has given it a very glossy finish not unlike my window. Well I hope you have all had a good Christmas and I look forward to sharing more projects, ahem! finished ones, with you in 2014 ! Here are some of the supplies I've used, available from Kim's eclectic Paperie shop. It is gorgeous. The embossing almost makes it look like an enamel tile. LOVE it. And love the way you colored the leaves and bird. I think this would be awesome as a hanging. This is beautiful! I love your color choices! This is lovely, it looks like a tile with its crackled surface. Really a beautiful piece - I am going to give this is go! Happy After Christmas Ever After!! 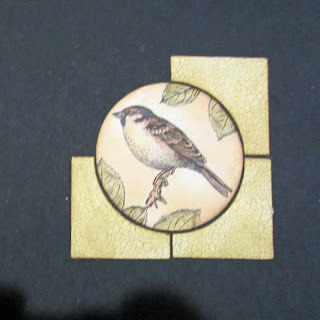 Finished or not it is the best use of the technique I've seen and I have a sister-in-law who loves stained glass and every Thanksgiving (here in the US) would do a faux stained glass project with the kids -- she deserves this! And a prayer journal for her would be perfect! You are an angel! Toni, this is STUNNING! I too thought it was a tile! 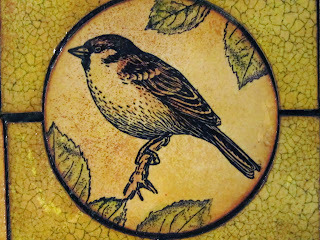 FAB colors and LOVE the bird! Your stained glass project is stunning and how lucky to have a real stained glass window like this in your bedroom too! Love the bird and the crackling is amazing. Hope you have a very Happy New Year. Hugs, Anne x. Beautiful work - what a lovely creation, Toni!